This is a two hour time lapse video of one of my online painting classes with a student from Saudi Arabia. 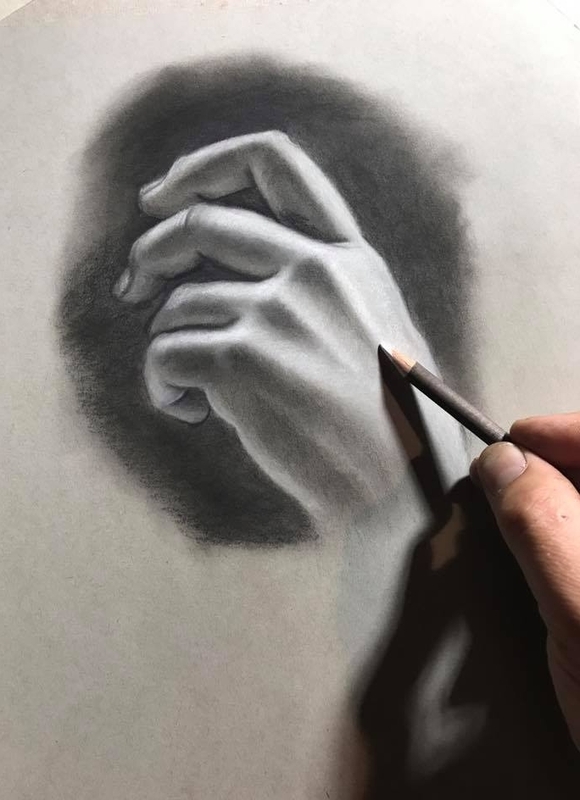 If you've been searching for "private art lessons near me" and were directed to my site, you may be worried your location or even your skill level will prevent you from working with me. Well, I have wonderful news, there is nothing stopping you! Question: I would love to take lessons from you but I don't live near your studio in Hamburg, Pennsylvania. 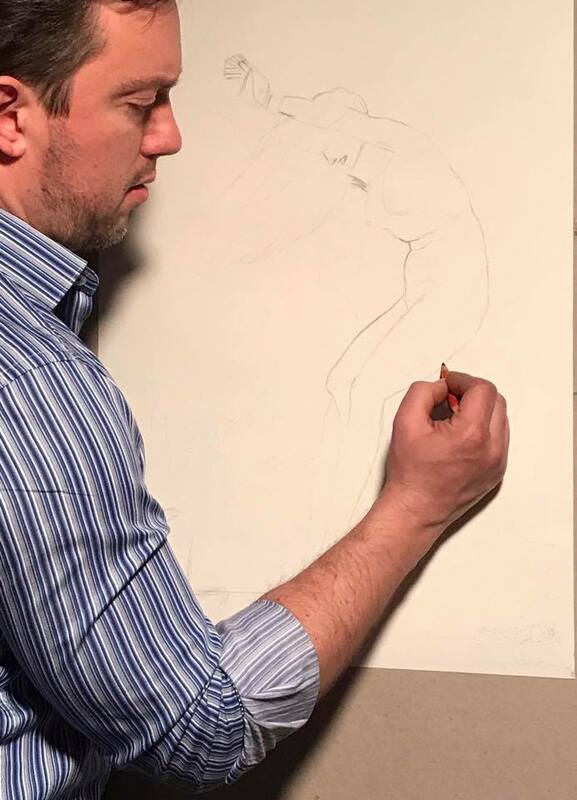 Working with one of my online drawing student's from Arizona on a copy of Gustave Doré's painting of "Andromeda"
Answer: I can teach lessons to you from anywhere in the world. 95% of my students are from outside the area and some are even outside of the USA. If you have a computer, a tablet or a smartphone I can teach you using Google Hangouts, FaceTime, Skype and Facebook Video Chat. You don't even have to leave the comforts of your own home. Question: How do your online video lessons work? Are they downloadable? Answer: All lessons are real-time lessons using one of the video programs I mentioned. Online lessons are taught the same way I teach in-studio students - in other words, you're getting the same experience. You'll never receive harsh judgment - just encouragement and clear, uncomplicated instruction. As a student, you have the option of either working with me on your painting or drawing or you can simply watch me work on our project and ask me questions and take notes so you can work on your own time between lessons. You can then send me photos of your progress to my email address and I will give you feedback on your work. It's all up to you and we will do whatever you are comfortable with. Question: "I would really love to work with you but my work isn't good enough yet." Answer: I teach students of ALL levels, ages, and backgrounds. This means you can be a student just starting out, a retiree picking up painting for the very first time or someone looking to brush up on their experience. I treat everyone the same. This is YOUR time. My lessons are customized to your goals and I will work along with you to develop your talents and help you overcome your weaknesses. As I've mentioned many times in my videos, I didn't have a mentor when I was learning to paint so I've dedicated myself to helping artists overcome their self-imposed limitations. So don't delay your dreams, take action and make huge strides in your abilities no matter where you are starting from. If you'd like to hear some feedback from my students please read my Testimonial Page. Question: Can I study with you in person for a workshop and then continue online? Answer: Yes. In fact, many of my online painting and drawing students study with me before and after they've finished an individual workshop. Both experiences are great opportunities to engage with me and to work through your artistic challenges. This is your custom experience and it should suit your needs. I am here to help you facilitate the experience. No matter what your path, my goal is to help you grow as an artist.